Taiwan Zinc Oxide Grade suppliers -AY | CATHAY CHEMICAL WORKS, INC.
Zinc oxide suppliers provide good products - Zinc Oxide Powder. Zinc Oxide Powder has been used for centuries to protect the skin from irritants such as in diaper rash creams and to dry the weeping. If you ask yourself Where can I buy zinc oxide powder, You can buy it here. Top-notch Zinc oxide grade manufacturers in Taiwan. 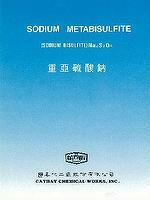 Taiwan zinc oxide grade manufacturers. Zinc Oxide Grade-AY is the calcined zinc oxide, also named Special Zinc Oxide. It is calcined at a high temperature of 1200℃ in a special equipment by a special process. The product is superior in quality and of high purity since the volatile matter contained in common zinc oxide has been burnt out. 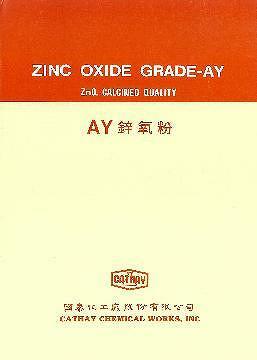 Zinc Oxide Grade-AY is a white or ivory yellowish powder, insoluble in water, but soluble in HCL. - The product tends to protect the rubber by its opaqueness to ultraviolet light and by its high thermal conductivity. - Zinc Oxide Grade-AY is a rather refractory oxide, melting at about 1975℃ , and yet when used in moderate amounts in ceramic products, it acts as a flux, decreasing the softening temperature of the product, lowering its viscosity and increasing the maturing range. -It enhances high brilliance and luster of glass, glazes and enamels. It contributes to the fusibility and helps to control expansion, thus increasing elasticity and resistance to thermal and mechanical shock. - In ceramic and pottery industry, it reduces the coefficient of thermal expansion, thus increasing the quality of products, improving resistance to oxidation and imparting high stability against deformation under stress.